I know the picture above was a little hard to see. I found it stuck to my door on my way to bed Tuesday night. 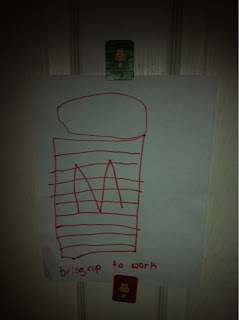 It's a drawing made by Lydia of the cup I often take to work, and the note "bring cup to work". Tuesday night, I mentioned how I had forgotten my cup and Nate mentioned that he would make me a sign so I would remember. 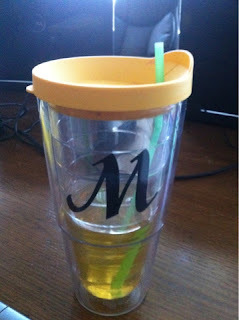 I laughed and said that wasn't necessary -- but I did need to remember it so that I drink enough during the day. Lydia overheard, and took it on herself to draw my cup and then enlisted Colin to write the note. She then found a couple stickers and stuck it to my door so I couldn't miss it. I have such sweet kids! Pillsbury Baguette Chips - Giveaway!